A surprising side effect of social media has been its impact on television viewers and program ratings. Twitter and Facebook, often seen as new distractions competing for a viewer’s time, have instead become surprising forums for real-time referendums about TV. From griping about a missed football play or to express shock or surprise over the conclusion of “Breaking Bad,” viewers are watching their favorite shows “live” because of spoilers and the general chatter on social media. Social media has become today’s new “water cooler” in terms of conversations about TV programs and events. In addition to creating chatter and buzz among current TV viewers of a show, social media is also driving new viewers to programs. Nielsen recently announced the commercial launch of Nielsen Twitter TV Ratings, the first-ever measure of the total activity and reach of TV-related conversation on Twitter. Nielsen Twitter TV Ratings measure not only “authors” – the number of people tweeting about TV programs – but also the much larger “audience” of people who actually view those Tweets. Watching TV with a laptop, smartphone or tablet in hand is rapidly becoming mainstream behavior; 55% of respondents in a study by PriceWaterhouseCoopers reported doing so at least some of the time. With Twitter, whose users, unlike Facebook’s, see each other’s posts in real-time, spontaneous public conversations can happen. Chart courtesy of Wall Street Journal. Initial analysis of Nielsen Twitter TV Ratings shows that the Twitter TV audience for an episode is, on average, 50 times larger than the authors who are generating Tweets. For example, if 2,000 people are tweeting about a program, 100,000 people are seeing those Tweets. This multiplier can vary across programs. If a show with lower ratings is creating buzz on Twitter, many believe it should get credit for that added reach in terms of its value to advertisers. Some shows are hits both on social media and in the TV ratings. 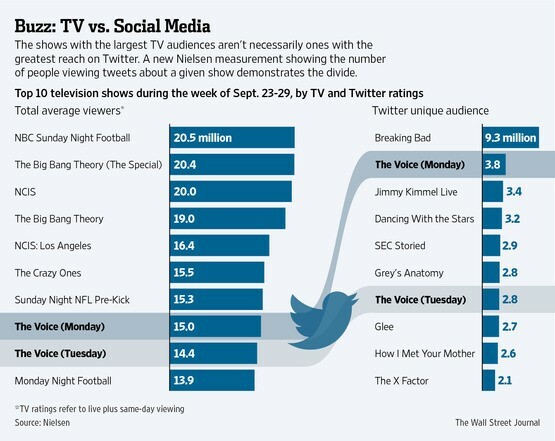 The finale of the AMC’s “Breaking Bad” was #1 in the Twitter TV ratings for the week of 9/23, with 9.3 million unique users seeing tweets about the show, and had the sixth-highest TV rating among 18- to 49-year-old viewers. Some programs, like live events (e.g., the Super Bowl and the Oscars) and/or competition shows such as “The Voice” – especially lend themselves to social-media activity. But many shows with mass-market appeal don’t have as much traction on Twitter. CBS had five of the top 10 shows on TV during the week of 9/23, including the “Big Bang Theory,” “NCIS” and “The Crazy Ones.” None of these top shows were in the top 10 of the Twitter TV ratings. Many shows encourage tweeting among viewers by posting Tweets on the TV screen by its stars/performers (e.g., “The Voice”). Hashtags are created (like #TeamAdam) and viewers can follow along and take part in the conversation offering their own commentary during the course of the show. And best of all for marketers, some Twitter viewers are also tweeting about the commercials they see in the show – what they like, don’t like about the advertisement or about the product or service itself. Not to be left in Twitter’s dust, Facebook has opened up some of its members’ public musings about TV shows to broadcast networks such as ABC. As part of an agreement, the network has started to cull data about Facebook users for its reality show “Dancing With the Stars.” The program’s producers are using Facebook to flash statistics on screen showing how many of its users are discussing the program’s contestants at a given moment, as well as which dancing couples generated the most chatter. Part of the challenge for Facebook is most people can’t see the full sweep of posts about a particular topic, whether it’s “Dancing With the Stars” or a world event. Facebook users are generally only privy to posts from their immediate circle of friends and family. Twitter, by contrast, is a public platform. Bottom-line, the dual-tasking of TV viewing while using Twitter (or Facebook) can generate strong engagement with a program, create an emotional connection, build loyalty among viewers and attract new viewers. It’s good that there are now metrics to quantify the extent of Twitter’s social impact of a program. And as more and more commercial and cable networks elect to use Twitter as a tool to market its programs, more people will be interested in using Twitter. Would love to hear your comments, are you tweeting while watching TV? ‹ Wearable Computing or Redundant Gadget?